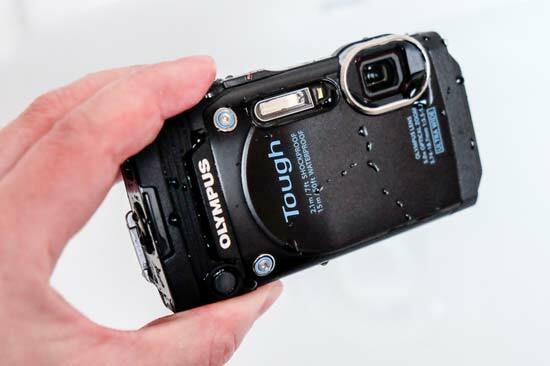 The Olympus TG-860 is a 16-megapixel compact camera that is waterproof to a depth of 15m, shockproof from 2.1m, freezeproof to -10 °C and crushproof up to 100kg. The TG-860 features a 21-105mm zoom lens, improved video capture options, GPS with multiple satellite system support, built-in Wi-Fi, a variety of shooting modes, a 180-degree flip LCD, two customisable function buttons and Full HD video capture at 60 frames per second. 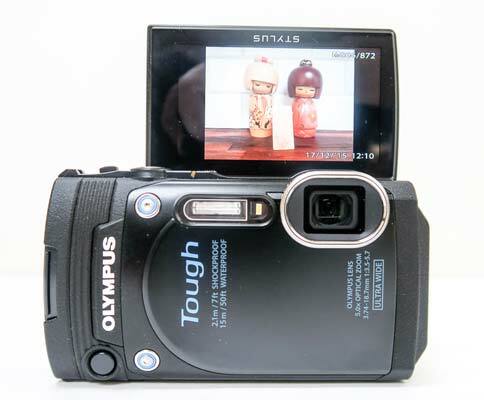 Available in white, orange or black, the Olympus TG-860 costs around £230 /$250. Premium compacts, CSCs and DSLRs aside, toughened cameras are one of the few classes of photographic device still being developed and advanced. 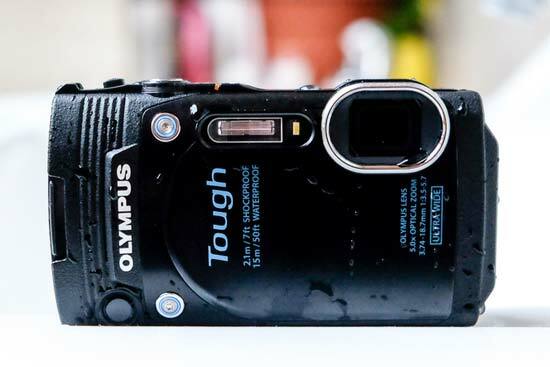 We reviewed Olympus’ TG-4 toughened camera back in October 2015. Now the same manufacturer’s 16 megapixel, backlit CMOS sensor incorporating TG-860, announced back in spring 2015, arrives on the Photography Blog review slab as we enter 2016. Manufacturer’s recommended retail price is an affordable £229.99, down from £269.99 on launch. A choice of bodies is available: choose from white, orange or black - the version we got to try out for the site. 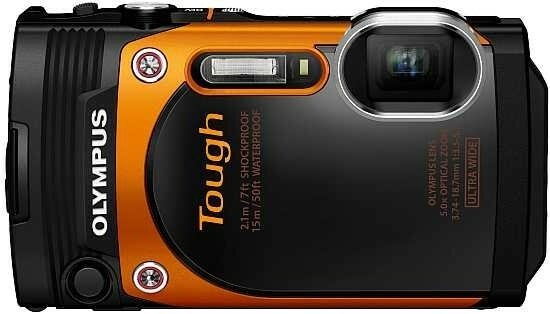 It’s worth noting that, in an age when most compact point and shoots have been killed off by the camera facilities of our smartphones, the toughened qualities of the Olympus TG-860, perhaps more than any other factor, give it reason to still exist. For the record, the TG-860 is claimed to be waterproof to depths of 15 metres, shockproof against drops from 2.1 metres in height, crush-proofed to withstand pressures equivalent to 100kg, plus also freeze proof down to -10°C. Like the OM-D range, the camera also comes with body integral 5-axis image stabilisation in an attempt to deliver blur free photography and video (here at capture rates up to 60fps). Handy, as there is not much in the way of a handgrip provided on this almost completely flat-fronted camera. Nevertheless the TG-860 feels reassuringly solid when gripped in the palm, with no discernable ‘give’ to the bodywork if squeezed particularly tightly. Unsurprisingly given the above, the standard 5x optical zoom lens is once again an internally stacked mechanism; at no point does it protrude from the body. This keeps it safe from harm, even when at maximum telephoto setting: namely a focal length equivalent to 105mm in 35mm terms. Conversely, the widest setting here is an ultra wide 21mm equivalent, thereby allowing capture of panoramic landscapes; an actual automatically self-stitching panorama mode is included as a shooting mode option here. In addition, select the Sport/’Sportcam’ mode and image aspect ratio is automatically set to the wider 16:9 (as opposed to the otherwise regular default 4:3 aspect ratio). Core spec aside, it’s the other little helpful details that impress here; like the choice of two shutter release buttons, enabling easier operation if shooting in portrait rather than standard landscape fashion, as well as generally making life easier and avoid us fumbling with the camera if wearing gloves or wet handed from the pool. As one would expect, the Olympus TG-860 is Wi-Fi enabled and compatible with the free-to-download Olympus OI Share app. It also offers up built-in GPS, whilst at its heart is a TruePic VII processor wedded to that 16MP CMOS chip. Full HD videos are included as standard, at up to 60fps and with stereo sound, as is the regulation slow motion video mode for sports fanatics and dedicated selfie mode for narcissists. Also useful for this purpose is the 3-inch back plate LCD, that can be flipped up to face the subject. Resolution is a standard 460K dots. Like with nearly every digital compact these days, the battery is charged in-camera, with a mains adapter, plug and USB lead provided for the purpose. The port for the USB lead – and mini HDMI cable – is within the compartment that also houses the rechargeable battery – so the battery door must remain open for its power cell to be charged. Turn the Olympus TG-860 on and though commendably quick to respond in just over a second or so, the simplistic menu systems and operational bleeps deployed by the TG-860 already feel like they belong to a different era. Perhaps that’s partly because we don’t actually get that many straightforward point-and-shoot compacts released any more. Or at least the higher priced models we usually play with don’t feel the need to hold our hand through the process of setting up and capturing images. From the front then, the Olympus TG-860 doesn’t resemble much of a departure from the Olympus Tough series compacts of old, or indeed its TG-850 forebear. But hey, if it ain’t broke don’t fix it, right? We have the familiar metal screws adorning the faceplate to give the camera a strong industrial look that suggests functionality rather than style, plus marginally raised, ridged end in lieu of an actual grip to prevent fingers slipping – plus narrow lozenge-shaped window housing the flash and AF assist/self-timer lamp. Both flash and lens are behind an extra layer of protective glass, whilst the metallic lens surround protrudes slightly in order to take any possible blows, rather than them being received by the lens itself. So much, so familiar then – and it’s easy to at first overlook the secondary shutter release button that sits unobtrusively on the camera’s fascia, just below the Olympus logo, which automatically falls under the middle finger of your right hand as the camera is gripped. More familiar than the above are the features on the camera’s top plate: tiny pin pricks housing the stereo microphone/s, a main power button with a roughened surface the size of the head of a tack/metal nail, plus larger (main) raised shutter release button the size of the base of a pencil. Squeeze this and it’s easy to feel your way to the half way ‘bite’ point at which focus is determined when squeezed – a subsequent press prompting the camera to take the shot. A maximum 16 megapixel, 4:3 format image is committed to memory in just over a second – so the camera is reassuringly swift, despite its reasonably modest price tag and frill free menu systems. 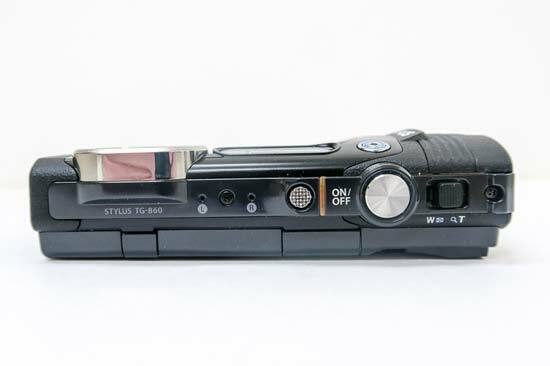 Just to the right of this shutter release, if viewing the Olympus TG-860 from the back, is a lever with ridged, non-slip surface for operating the zoom. Keeping things simple, that’s it: no rangefinder like control knobs here to over-complicate operation or possibly compromise ease of use in difficult shooting circumstances. Moving to examine the rear of the TG-860, and more than four fifths of the camera’s back plate is taken over by a large, tilting LCD screen that seems to exist purely for the taking of self portraits, as it flips upwards to face whatever is in front of the camera, but doesn’t tilt downwards or flip outwards to allow for further creative framing. On the plus side, this minimizes the potential for possible damage to hinges should the camera be dropped or take a knock – and there is potentially more creativity to be had than from a standard fixed screen. To the right of said LCD is a selection of thumb-operated controls that will be immediately familiar to anyone who has handled a digital camera over the past 15 years. This includes the five pence piece sized shooting mode dial, with intelligent Auto (iAuto) and Program mode settings, sitting alongside a panorama option that automatically stitches together elongated shots in-camera, selectable scene modes, a dedicated Super Macro mode, plus sports and Art Filter digital effects modes; so far, so Olympus. 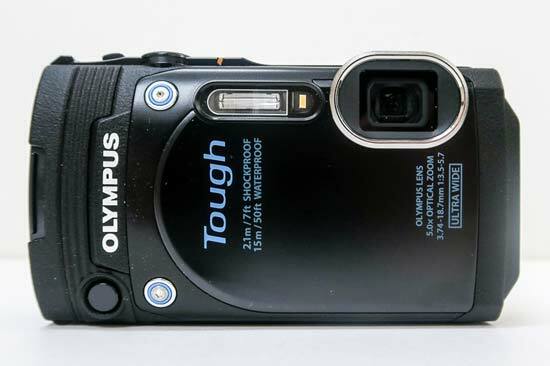 Top right of the Olympus TG-860 back is a self-explanatory dedicated red video record button, that sits within a slightly raised thumb pad, and requires a precise press with your thumbnail to commence operation – so it’s therefore difficult to accidentally activate it. Directly beneath this we find a playback button, and beneath this again a familiar four-way control pad for selecting menu settings, implementing them with a press of the centrally positioned ‘OK’ button – also used for tabbing through images. Again, the TG-860 is very straightforward and easy to use, which is exactly as it should be for a toughened model; you don’t want to be fiddling around with manual settings in the midst of the moment – this isn’t a camera that will, by and large, be used for considered framing and photography. With the southern most tip of the thumb controller doubling up as a delete button, below this we have another dual use control – the button for calling up the camera’s menu options and activating Wi-Fi. Adjacent is a larger than average industrial-looking lug for attaching a wrist strap – everything about this Olympus’ design suggests rigidity and chunkiness, even though it will comfortably and portably slip into any jacket pocket. Practicality is the key here, obviously, an ethos carried over into the double lock mechanisms (both a lever and a switch) protecting the dual compartment housing the camera’s battery and its SD memory card slot from the ingress of water, dust and other undesirables. The dual mechanism obviously ensures that this door to the internal workings of the camera doesn’t come open accidentally. Incidentally, battery life is put at an expected 300 shots maximum for the Olympus TG-860, which isn’t at all bad for this class of camera, and certainly a match for more premium priced compacts or small format CSCs. We shot well over 150 shots and the battery indicator was still showing just a third depleted. Also housed in this same compartment are the ports for optional mini HDMI cable and provided USB lead, so this is the hub of the camera that you’ll truly want protected. The base of the camera by contrast is unremarkable save for the fact that it features a screw thread not in the usual central position, but right over to one far side. There’s also a second tripod socket on the opposite side of the camera to the location of the input ports, SD and battery slots, which means that the camera can be mounted in such a fashion as to shoot portrait fashion if so desired. Directly above this secondary screw thread sits the built-in GPS antenna, and below this is the built-in speaker. Playing with the Olympus TG-860 in the depths of an English winter, we were only able to test its waterproofing qualities when using it in the driving rain, and subsequently dunking it underwater in the bathroom, holding it under a running tap with the camera activated and its back screen visible. Happily the Olympus’ screen was still working after the fact, as was the camera itself. Though there were a couple of tiny beads of moisture around the seal, no droplets had made contact with any sensitive inner workings. What’s more, water droplets simply run off the camera’s fascia and lens, quickly leaving both facets clear and dry. We look forward to taking the camera on an extended test diving in the Caribbean …at a later date. So how does the TG-860 stack up as an image taking and making tool? Read on to find out.